Holden Caulfield is crazy. Let's be honest. He's as crazy as his name is awesome. But many things about his character resonated with me, and I really enjoyed reading Catcher in the Rye. I've been on a mini-quest to read some books considered "classics" by most but that I've never read. I really enjoy reading fiction, as evidenced by last Thursday's post, and I figured there had to be something to these books to make them so popular and revered so widely as great stories. Anyway, I really enjoyed it. On its face it doesn't really have a point, I suppose. It doesn't really have your typical beginning, middle and end. I mean, it does in a sense, but it's much more subtle and you can't really figure out why Holden is telling you all this. You're also stuck inside Holden's head, which doesn't really allow for much of a level-headed, unbiased perspective. It's a bit of a rambling recap of the escapade that was his last 48 hours, but I very much enjoyed it. Primarily because I loved Holden as a character and could identify with a lot of his characteristics. 1) His rejection of all things "phony." Holden takes this idea to the extreme--to the point where he has little tolerance for anyone he comes into contact with. He lacks any sort of grace for people he sees as "phony" (which is most people). But I do appreciate that he wants people to be genuine and is fed up with all the pretense. I also like that he admits that some of it is necessary to life and, he hates the fact that he subscribes to the same thing himself. For example, when observing the fact that he says "Glad to have met ya" to someone he was not, in fact, glad to have met at all, he succumbs, "if you want to stay alive, you have to say that stuff, though." I totally identify with him on this anti-phony sentiment. Of course, I don't take it to the level that he does, but I am drawn to what I see as genuine and put off by what I feel is fake. And I, too, see the necessity for the little phony-isms here and there, even though I see the ridiculousness of it just like he does. And yet I still act sometimes like I was only about twelve. Everybody says that, especially my father. It's partly true, too, but it isn't all true. People always think something's all true. I love that. I, too, hate feeling like I am misrepresented--that one of my characteristics overshadowed the rest and someone I don't know very well might assume that's how I am all the time. I know that's also something to concern myself less with, but it still happens. I get the feeling that's what Holden was saying in that sentence. Nothing is 100 percent one way or the other. It's almost always a blend, and we have to be careful to make generalizations. 3) His desire to protect the innocent. Holden knows that life isn't pretty. He knows things aren't what they should be and that bad things happen. But he still strives to protect those that don't know it yet. Deep down, I think even he doesn't really want to grow up too fast. But while I was sitting down, I saw something that drove me crazy. Somebody'd written 'F*** you' on the wall. It drove me damn near crazy. I thought how Phoebe and all the other little kids would see it, and how they'd wonder what the hell it meant, and then finally some dirty kid would tell them - all cockeyed, naturally - what it meant, and how they'd all think about it maybe even worry about it for a couple of days. I kept wanting to kill whoever wrote it. I went down by a different staircase, and I saw another 'F*** you' on the wall.I tried to rub it off with my hand again, but this one scratched on, with a knife or something. It wouldn't come off. It's hopeless, anyway. Even if you had a million years to do it, uou couldn't rub out even half the "F*** you" signs in the world. It's impossible. That's the whole trouble. You can't ever find a place that's nice and peaceful, because there isn't any. You may think there is, but once you get there, when you're not looking, somebody will sneak up and write "F*** you" right under your nose.Try it sometime. I think, even, if I ever die, and they stick me in a cemetary, and I have a tombstone and all, it'll say "Holden Caulfield" on it, and then what year I was born and what year I died, then right under that it'll say "F*** you." I'm positive, in fact. I love that he wants to protect the world from its own badness, but he can't. He realizes it's impossible, but he still tries. I love that nobility. Especially in a 17-year-old. 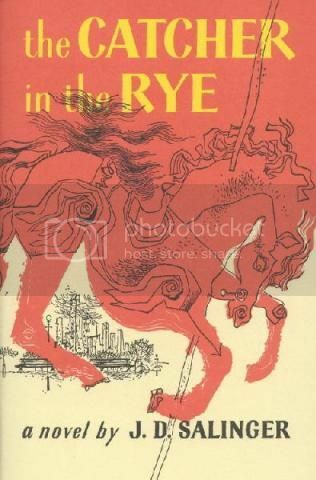 If you want an enjoyable, quick read that you can still learn from, I highly recommend Catcher in the Rye.